NHL News : Imminent trade coming to Chicago!? Imminent trade coming to Chicago!? Different season, same issue for the Chicago Blackhawks... 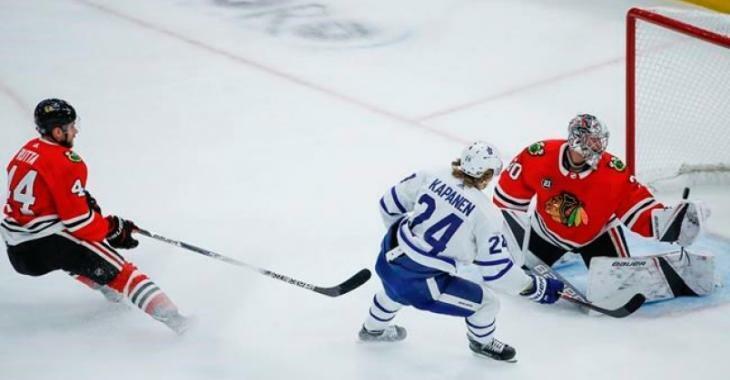 The goaltending situation in Chicago was a complete mess this past season and star goalie Corey Crawford’s injury was one of the main reasons the Hawks missed out on the postseason for the first time in 11 seasons. It all started when Crawford got injured at the end of December. He missed the final 47 games of the campaign with a head injury. It ended up being a season-ending injury and it was a shame since Crawford had the second-best save percentage in the NHL among No. 1 goalies at .929. For the second half of the season, the Hawks needed to put their trust in many netminders, including Anton Forsberg, Jeff Glass, J-F Berube, Collin Delia and Scott Foster, who combined to post a .901 save percentage. It seems to be no different this season, so far... The backup plan while waiting for Crawford to return was to trust veteran netminder Cam Ward. However in four games so far this season, Ward has given up 14 goals on 89 shots, a .843 save percentage. They could play Forsberg as many thought he would start against the Toronto Maple Leafs on Sunday, however, they cannot keep the campaign going with three netminders as Crawford could be ready to return on October 18th at the earliest. Scott Powers of The Athletic believes that the Blackhawks are likely going to have to move Forsberg in the next couple of weeks as they aren’t going to carry three goaltenders. Ward has a no-trade clause, so they’ll have to either trade Forsberg or put him on waivers. "There were whispers the Blackhawks opted against starting Forsberg on Sunday for fear he would only complicate the team’s goalie picture had he played well. That might just be conspiracy talk, but the Blackhawks are likely going to move Forsberg in the coming weeks regardless of what he does in the coming weeks. When Crawford returns, the Blackhawks will have three goalies, and Quenneville has already said he doesn’t plan on carrying three. And because Ward has a no-movement clause, the Blackhawks are expected to either trade or waive Forsberg," explains Powers. While the Hawks' defense has also been an issue, the team has made something quite clear: they desperately need Crawford. If they move Forsberg, he might not bring in a great return, but could maybe add some depth to their blue line.